With the introduction of the Lumia 630 and 635 models, we have our first look at the next generation of low cost Windows Phone devices, and the Lumia 630 is a phone with many firsts for this segment. It’s the first phone launched with Windows Phone 8.1 from any manufacturer. It’s also the first phone released after the acquisition of Nokia by Microsoft, though the phone was announced at BUILD prior to the final paperwork was completed on the acquisition. This is the first Windows Phone ever with an optional Dual SIM model. This is also the first Windows Phone which incorporates a SensorCore branded pedometer. It’s the first Windows Phone which replaces the hardware back, home, and search keys with on-screen equivalents, and unfortunately it’s the first Windows Phone which is lacking a hardware camera button, ambient light sensor, and proximity sensor. This is definitely a device of firsts for Windows Phone, but not all of the firsts are good news. Last year, Nokia released the Lumia 520 and to say that this one device changed the Windows Phone landscape forever would be an understatement. Microsoft was trying very hard to try and capture some of the high end smartphone segment, but with a smaller app store and generally lower specifications than competing devices running Android or iOS, it was a tough sell. Suddenly Nokia released a device which was a capable smartphone and could be had for a low price – often less than $100 off contract. At the time, competing Android phones in that segment would often be running very old versions of Android, have very low specifications, or both, and of course Apple doesn’t play in this segment. Within a single year, the Lumia 520 accounted for over 30% of all Windows Phone devices. Clearly the high volume for Windows Phone was the low cost, off contract devices. Though Nokia (now Microsoft) still continues to make and sell higher end devices such as the Lumia Icon (930) and 1520 phablet, the low end of the market is where the volume is, and many of the changes to Windows Phone over the last year have been to help drive down costs of the devices by removing the requirements for certain sensors, hardware buttons, and creating a reference platform with Qualcomm to allow ODMs to easily create Windows Phone devices. We are seeing the same thing happening with Android as well, with the low cost segment practically ignored by all OEMs until Motorola launched the Moto G which is a capable smartphone for a budget price, and now with the Moto E they are aiming even lower. The Lumia 520 is still a capable competitor at a low price, but the landscape has changed in the past year, and good enough is no longer enough. 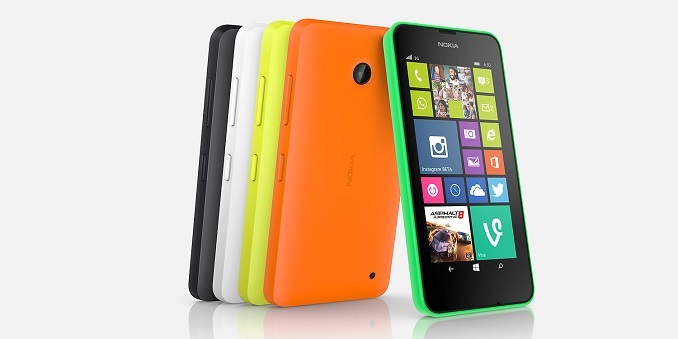 By name, the Lumia 630 is the successor to the Lumia 620. 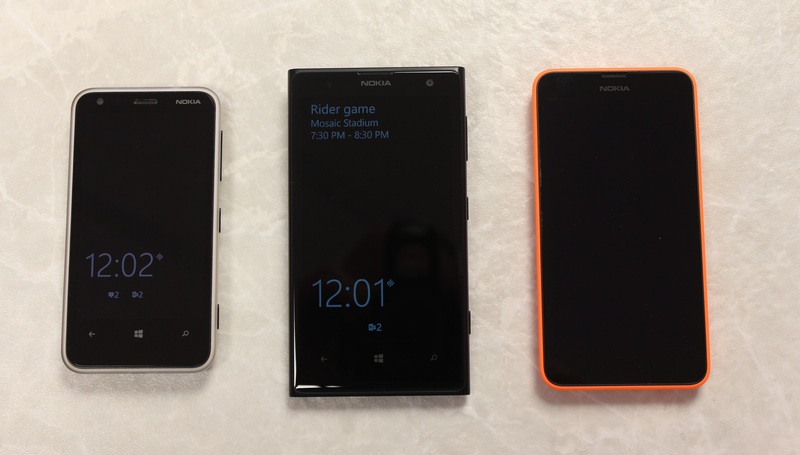 But truly it is a successor to the Lumia 520, as the Lumia 620 still outdoes both the 520 and 630 in features. Display Size 4.0" 3.8" 4.7" 4.5"
The 630 loses a lot of features over the Lumia 620 in an effort to hit an even lower price point than the 620 did. It keeps the ClearBlack display (more on that later) but loses practically everything else. The Front Facing Camera is gone, the rear LED flash is no more. Near Field Communication (NFC) was in the 620, but is no longer in the 630. In fact, as seen in the above chart, the 630 even loses out over the 520 with the lack of proximity sensor, and more importantly the ambient light sensor. All of this was an effort to keep the Bill of Materials down to allow the device to be sold for a lower price, and on that front they did do well with the Lumia 630 having an off-contract price of around $160, compared to the Lumia 620 which was about $240 when it launched. The biggest omission in my opinion though is the lack of Glance Screen support. For those that haven’t used a Lumia with Glance, it arrived last year with the “Amber” firmware update, and first debuted on the Lumia 925. It’s been updated several times, and the most current version of Glance is simply fantastic. With Windows Phone market share not being very high, it’s probably a good idea to go over Glance. The Glance screen is simply the phone displaying some information on the display when the device is powered off. With all versions of Glance, the clock and several phone settings such as vibrate or charging would be displayed on the screen. With updates to the firmware, other features soon came such as the ability to display lock screen notifications on the glance screen as well, so you can tell if you’ve missed calls, texts, or other notifications with the device off. 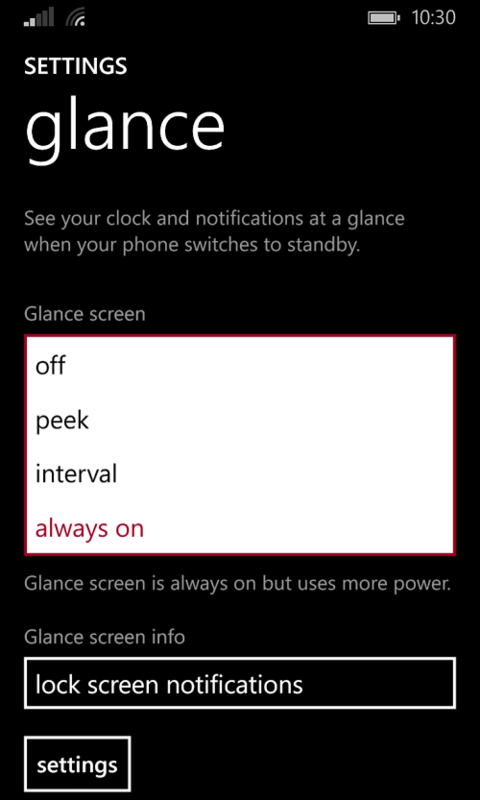 With the last update to glance, the detailed lock screen notification for Windows Phone (in my case, my next appointment in the calendar) will briefly appear on the Glance screen when you either turn off the phone, or if the phone senses your hand over the phone. The detailed info goes away at the first Glance refresh to keep the power consumption down. You can optionally enable Glance periodically at an interval, or with a peek mode where it will only enable Glance when it senses your hand over the display. Glance works by utilizing panel self-refresh to be able to display some items with the display off. This feature is better with AMOLED displays, because they can display a small amount of white text with minimal power draw, but even so Nokia has made the Glance screen optional on LCD equipped devices as well, including the Lumia 620. As for why it’s missing, as with everything it comes down to cost. The Lumia Icon (930) is also missing Glance because Nokia couldn’t source a panel with memory for a reasonable price, but the 630 has the added caveat of not including either ambient light or proximity sensors to disable Glance when the phone is in your pocket. We're not sure if the 630 display includes memory or not but it could certainly be a contributing factor to it being unavailable on this model. - Phones are not laptops, the difference between cheap to game capable laptops is the CPU/GPU, but the only spec that halts game installation is RAM, the GPU/CPU will run most games just fine. - Furthermore even the Lumia 525 (which is also a budget phones, released after 625, before 630) started to include 1GB of RAM, but Microsoft seems to be retracting back to 512MB of RAM, puzzling. I have a Lumia 525 and a 920. It's one of my favorite features on my Lumia 920 as I'm outdoors allot, the screen brightens up and the contrast and gamma increases so that sunlight readability is a non-issue. However with that said, many games and apps which have a 1Gb Ram version also have a 512Mb version, a-la. - Spartan Assault, so for some users, having 512Mb of Ram is a non-issue. Just to be clear I didn't say it was bad the store stops you from installing games you can't run. What's bad is it is 2014, and this phone has the same RAM as a Windows Phone 7 device from 2010.